Find a new Jeep Renegade at your local Anchorage, AK Jeep dealership. 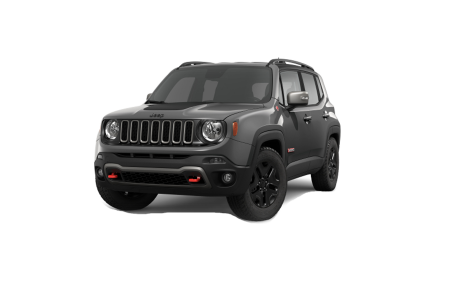 Overview Anchorage Chrysler Dodge Jeep Ram Center in Anchorage, Alaska has a great selection of cars, trucks, and SUV vehicles available, including the new Jeep Renegade. The Jeep Renegade is packed with power, features enough seating for five, has advanced multistage front airbags, and a turbo powered engine. Whether you're out running errands or taking on your next adventure, this SUV is the stylish choice. Test drive the Jeep Renegade today at our Anchorage, AK Jeep dealership! Why Us? At Anchorage Chrysler Dodge Jeep Ram Center, we pride ourselves on excellent customer service from the moment you stop by our lot. From our attentive and experienced car sales associates to our knowledgeable automotive financing team, we'll be here through every step of the car buying process. To get started, visit our Anchorage, AK Jeep dealership today! New Jeep Renegade Service & PartsYou can trust the experts at Anchorage Chrysler Dodge Jeep Ram Center to take care of your Jeep vehicle! Our automotive service center is here to keep your vehicle running smoothly. From oil changes and tire rotations to more serious body repairs, you can count on our certified auto technicians to have you back on the road in no time. Give us a call or schedule your next vehicle maintenance appointment online. We look forward to serving you at Anchorage, AK location!